June is traditionally LGBT Pride Month from coast to coast, but while we celebrate what is unique and relevant to us as a community, it is also an opportunity to remind everyone of LGBT contributions that bring us together regardless of sexual orientation, race, religion and heritage. “America the Beautiful” is only one memorable song cherished by the public, and written by a lesbian or gay man. “I Left My Heart in San Francisco” is another, written by life partners George Cory and Douglass Cross. They were a New York City couple that had made a visit to San Francisco, and wrote the song in 1954. By chance, they gave it to Tony Bennett’s agent, and Bennett introduced the song in San Francisco as a gesture to the city. Bennett says he never realized the song would be so popular. Cross and Cory are said to have lived for a time in the Bay Area and in writing the song, compared New York to San Francisco with the opening stanza of the song. In the 1990’s, one Arkansas school district ordered the words rewritten to omit the word “gay” from the lyrics. An equally romantic song, often a favorite among couples, is “My Funny Valentine”, written by Lorenz (“Larry”) Hart, another gay man. Hart, the lyricist half of the famed Rodgers & Hart songwriting team (a non-romantic partnership), also penned “Blue Moon”, and dozens of other familiar standards. Billy Strayhorn made musical history when he wrote, “Take the A Train” for Duke Ellington. Strayhorn, born in Ohio, met the Duke as a teenager and confided his desire to join the orchestra. Ellington gave him detailed directions to his home in New York, including how to take the “A train”. As Strayhorn eventually made his way, his mind kept repeating, “Take the A Train” and he turned it into Duke Ellington’s signature tune. Strayhorn stayed with Ellington throughout his career, finding a tolerant place for his openly gay lifestyle. What all of these LGBT figures have in common is not simply that they were LGBT people, but that their accomplishments made the world a better place, bringing us even more together as a united people. Forty Years of Progress marks the fact that today’s LGBT community members are better able to live their lives without fear and, as a result, contribute to our communities and our nation. For decades, LGBT people lived in their own country as though on a parole that could be – and too often was – revoked at a moment’s notice. Anti-gay hate crimes account for half of all hate crime murders in the FBI’s annual report. Anti-gay hate crimes are the most physically violent of all hate crimes, the same FBI report states. One of those was young Matthew Shepard, a Wyoming student beaten unconscious, tied to a cattle fence in a mock crucifixion, and left to die in 1998. In Alabama, Billy Jack Gaither was kidnapped, placed in the trunk of a car, driven to an isolated spot, lit several times with kerosene, beaten with an ax handle, and then thrown on burning tires. In New York City in 1989, a young Ecuadorean was murdered because thugs mistakenly thought he and his brother, walking arm in arm, were gay lovers. And in Iran in 1988, two young teenagers were publicly hanged on charges that they were gay. In the early 1950’s, an estimated 7,000-10,000 suspected lesbian and gay federal workers were either fired or forced to resign from their careers. Included was Acting Secretary of State Sumner Wells. At the State Department, there was an average of one firing every day for suspected homosexuality. The Pulitzer Prize-winning Advise and Consent fictionalized one real-life event when leaders of the opposition party blackmailed a U.S. Senator from Wyoming after his son was arrested on a homosexual charge. In 1954, Senator Lester Hunt (D-Wy), a former governor and incumbent Senator, agreed to their blackmail demand that he resign so that the governor could name a Republican to his seat. Eleven days later he shot and killed himself in his Senate office. It wasn’t until 1978 that the federal government adopted a policy ending anti-gay hiring policies. Even then, it was disguised in a congressional guidance that state federal employees could not be dismissed for “non-job related causes.” Saying sexual orientation out loud was too controversial. When President Obama entered office, federal policy denied LGBT employees being transferred to another office to claim expenses for the family dog or cat, but not for a domestic partner. Federal housing policy didn’t spell out a policy of nondiscrimination in federally funded public and assisted housing or other housing programs. Much of the change over the past two years came at the prompting of former San Franciscan John Trasvina, currently serving as the Assistant Secretary of Housing and Urban Development for fair housing and equal opportunity. He led hearings around the nation and won support from Secretary Donovan for new federal regulations that are inclusive. Harvey Milk’s life and death has sent a worldwide signal that San Francisco is a city that pioneered a place of safety and empowerment for LGBT people. Before Milk, there were others who contributed to changes in San Francisco – sometimes at the cost of careers and arrests. On New Year’s Eve, 1964, ministers with the Council on Religion and Homosexuality hosted a costume ball for the LGBT community at the California hall on Polk Street. Despite prior negotiations, police began targeting guests. Ultimately paddy wagons were called and dozens arrested, included attorney Herb Donaldson. Years later, then-governor (and now governor) Jerry Brown named Donaldson as a state court judge. In August 1966 at Compton’s Cafeteria at Turk and Taylor, police were called and a riot took place, this time involving a visible and large contingent of transsexuals. Arrests resulted again, but this time the outcome was the establishment of the nation’s first transgender network for support. June is celebrated as Pride Month because it was in June 1969 that police raided a gay bar in New York’s Greenwich Village called Stonewall. A crowd gathered and started to heckle the arresting officers, the crowd grew, copper pennies were thrown as a taunt of “copper” and for the next several days hundreds took to the streets to demand an end to police harassment. 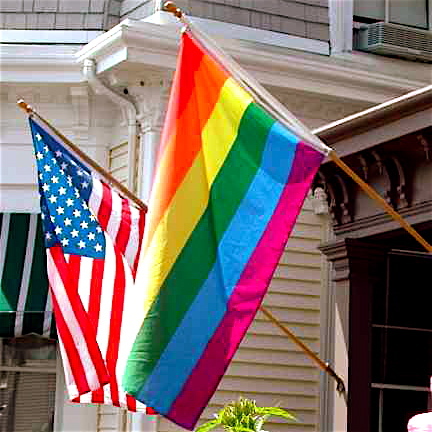 Today that gay bar battle is honored and celebrated worldwide. Over the past 40 years, a more open community and a more tolerant America challenge such horrors –once the dominant news about lesbians and gay men –. One signal: there are now 172 open LGBT officials in elected and appointed offices just in California. Holding office is just one measure. Another is the participation of LGBT people in all aspects of the community and nation. One young man, a member of a Bay Area rugby team that won a place in the region’s league as an openly LGBT team, put it well. The young man was Mark Bingham, weeks later a passenger on Flight 93 on September 11, 2001, and who joined with other passengers to stop a terrorist attempt to crash the plane into the White House or Capitol. In thwarting the terrorists, Bingham and the others gave up their lives to protect the nation.